‘Pay it forward.’ You hear it everywhere, but what does it mean? 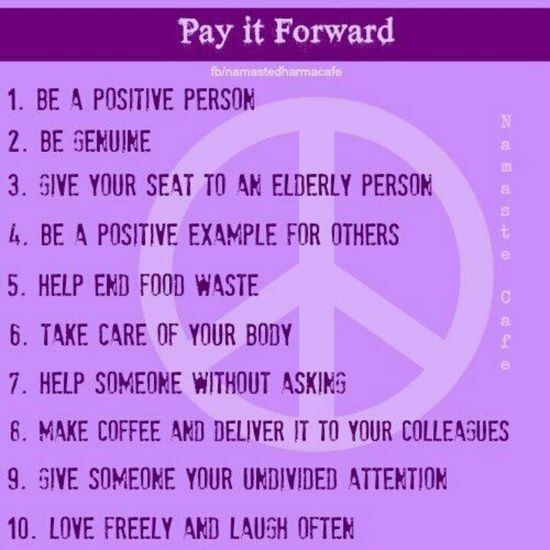 Pay it forward is not a new idea, but in the last few years, it’s a buzzword and a huge global movement. From Facebook to “Kindness” web communities with tips on how to pay it forward, there’s no getting away from it. Pay it Forward. A positive trend! 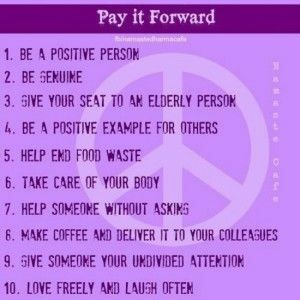 Pay it forward is a term describing the beneficiary of a good deed repaying it to others instead of to the original benefactor. Specifically, the creditor offers the debtor the option of paying the debt forward by lending it to a third person instead of paying it back to the original creditor. Debt and payments can be monetary or by good deeds. The phrase is first mentioned in a book with that title by Catherine Ryan Hyde. In the book the phrase is used as the opposite of payback: when someone does a good deed for you, instead of paying them back, pay it forward by doing a good deed for someone else. Catherine Ryan Hyde’s Pay It Forward takes as its premise the bumper-sticker phrase “Think Globally, Act Locally” and builds a novel around it. The hero of her story is young Trevor McKinney, a 12-year-old whose imagination is sparked by an extra-credit assignment in Social Studies: “Think of an idea for world change, and put it into action.” Trevor’s idea is deceptively simple: do a good deed for three people, and in exchange, ask each of them to “pay it forward” to three more. “So nine people get helped. Then those people have to do twenty-seven…. Then it sort of spreads out.” The story was made into a movie in 2000. Pay it forward is about how it really is possible for one person – you, for example – to make a difference. Pay it forward doesn’t have to mean giving a large sum of money or expending a lot of effort. It could be as simple as holding the door for someone laden with bags or giving up a place in line to someone who appears in a rush. Tell someone you believe in their potential, even if they haven’t always shown you the same support. It could even mean spending a little cash on coffee for the person behind you in line at a coffee house. For those who have money they can afford to give, there are always people in need, but even the smallest, free gestures can make a difference.